Kalyangad(Nandgiri) FortHeight : 3500 ft.
Kalyangad is situated in Satara. All the forts in this area are built on the hilltops separated from the mountain range. The peculiarity of this fort is it is easiest to climb. The bus service here is good because sugar cane is grown on large scale and transportation is essential. 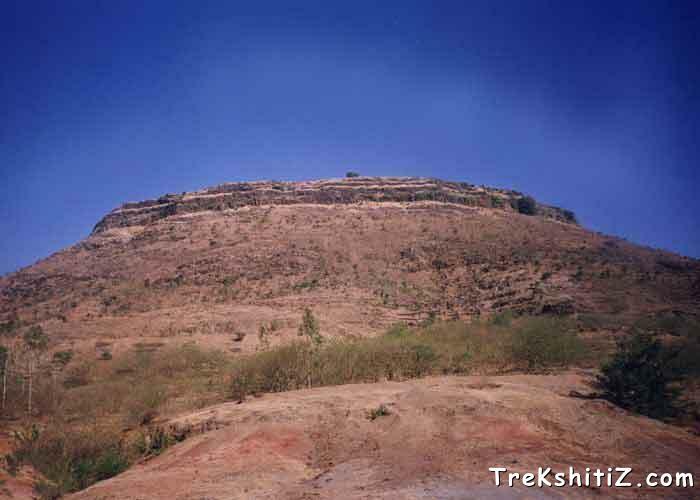 Kalyan gad is also known as Nandgiri fort. This fort was built by king Bhoj-II of Shilahar dynasty as mentioned in the copper plate inscription found in Satara. This fort appears to be built in between 1178 to 1209. It appears from many copper plate inscriptions of Shilahar kings that they gave many donations to Jain people. It has been proved that this fort is built by Shilahar Kings, as many statues of Lord Parshvanath are found in the cave on Kalyangad. In 1673 Shivaji Maharaj conquered Satara and surrounding regions. Kalyangad became a part of his territory. After Shivaji, the administration of Kalyangad went into the hands of Pratinidhis (representatives). Later, conflicts arose between Peshvas and Pratinidhis. The fort was taken over by Peshwa. In 1818 general Prisler brought this fort under British control. While going up towards top of the fort we see two entrances. The first gate faces the north. We see a temple after entering this gate. One way goes down towards the rampart along the temple. Here we can see a gallery. This is the most spectacular place on the fort. This gallery is 30m deep. There is water on both sides of the way inside it. On both sides of path there are iron rods at the end of the gallery. It is dangerous to go inside in rainy seasons. After seeing the gallery you should come back to the first door. The path, made up of steps, leads us to the door facing east. On entering the fort by this path we come across the temple of Lord Hanuman. There is a Bamanghar to left where we may find any hermit meditating. In front of the Bamanghar, there is a memorial of Kalyan Swami, who was a disciple of Ramdas Swami. There is a ruined temple of Shree Ganesh and a big lake ahead. A few steps ahead are the remnants of palaces. After going straight from this way for 10 minutes we reach to eastern part of the fort. From this point, we can see Jaranda, Ajinkyatara, Yavateshwar, Chandan, Vandan, Morya and Vairatgad. It takes approximately half an hour to watch the top of the fort. There is only one way to reach the fort. This way is from the base village of Nandgiri (Dhumalvadi). Board a bus for Satara Rd. from Satara station. Distance between Satara Rd and Nandgiri is 3 km. From here board a bus for Kinhaee, on the way to which Nandgiri is situated. Buses are available for every half an hour from Satara to Kinhaee. It takes 45 minutes to reach to the fort. There is a cave on this way. 5 to7 people can stay at Hanuman Mandir on the fort or in the compound of Bamanghar. One should arrange for food himself. Drinking water is available for whole year from the syrinx mentioned above.